If I didn't have this job, the job I'd most like to have is being the guy who stuffs the chunks of blue cheese into the olives. For one thing, I'm pretty sure it's going to be a long time before they can make a robot with the fine-motor skills to be able to do that. So, job security! But also, blue cheese is just the best. I'd be like Lucy in that I Love Lucy episode where she gets a job at a chocolate factory. As such, blue cheese is by far my favorite dressing. I'll eat it on anything from buffalo wings to leftover pizza. What I like to do is reheat the pizza in the microwave, which you're not supposed to do, but I DON'T CARE because I'm just going to slice it into strips and dip it in blue cheese dressing. I love it so much that I'll even serve it on a salad. I know, it's crazy. But think about what's happened to so many of the mayo-based salad dressings. Blue cheese, ranch, thousand island — they've all become dipping sauces, hamburger toppings, something you pour over french fries. But friends, no matter how much dressing you put on them, french fries are not a salad. I'll even go one step further. The much maligned iceberg lettuce, despite its reputation for being not very nutritious, is a wonder of cool, crisp lettucy goodness. 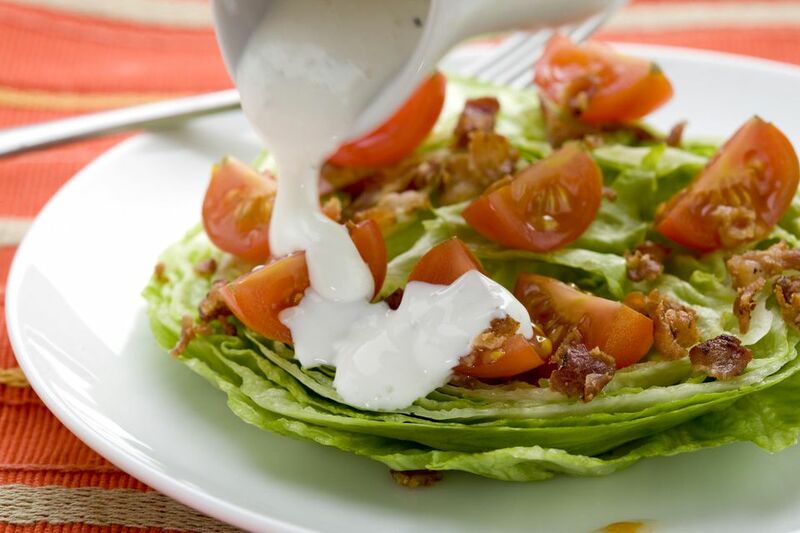 And there's a reason the chilled iceberg wedge topped with blue cheese dressing and crumbled bacon is a classic. Besides, if we never ate anything that wasn't optimally nourishing, well, that would be the end of french fries, wouldn't it? Pretty much any blue cheese will work for this recipe — including Maytag, Gorgonzola, Stilton or Roquefort. Aged blue cheese is more dry and crumbly than young blue cheese, and younger blue cheese is softer and has a more potent flavor and aroma. So experiment to see what you like. But it's pretty standard to use the more crumbly kind for making blue cheese dressing. I happen to like big, fat chunks of blue cheese in my dressing, so I definitely go with the aged variety. Also note that the ingredient list below includes freshly ground black pepper to taste, and I want to clarify that for this recipe, to taste means lots and lots of freshly ground black pepper. In a glass bowl, combine the mayonnaise, vinegar, Worcestershire sauce and cheese. Adjust thickness by stirring in some of the cream. Season to taste with freshly ground black pepper. Chill thoroughly before serving.